Use Finder to locate your downloaded client and double-click the file. The following window will appear. 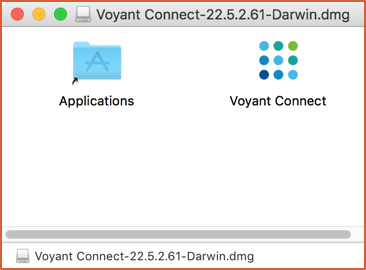 Drag the Voyant Connect icon over to Applications. Once copied, open Applications and find the Voyant Connect app. When launched the first time, a dialog will appear indicating the application was downloaded from the Internet and confirming if you want to open it. Click Open to start Voyant Connect. On first launch, an End User License Agreement will be presented. Review and click I Agree to continue with the installation, or Cancel to stop the installation. The Voyant Connect login screen will then launch. During the initial installation on Windows, an option is offered to install an Outlook plug-in. In order for the installation of the plug-in to proceed correctly and work with Voyant Connect, the installation should be done as an Administrator. Right-click the installation file and choose Run As Administrator. If you don’t have administrator privileges, see your IT staff for assistance. Additionally, Voyant Connect must be installed to the default C: drive location when using the Outlook plug-in. Do not change the location if using the plug-in. Use Windows Explorer to locate your downloaded client and double-click the file (or right-click and choose Run As Administrator as noted above). Choose your language for installation. Click Next in the Voyant Connect Setup box. The End User License Agreement will be presented. Review and click I Agree to continue with the installation, or Cancel to stop the installation. Next, review the installation options. If you are running Outlook with an Exchange server, an optional Outlook Plugin can be installed. You will need to exit Outlook to install this. Next, choose the location to install the application (use default if installing plug-in) and then whether to create a Start Menu Folder. Click Next and the installation will complete. When finished, click Next and then Finish to launch Voyant Connect.